At Overhead Crane & Conveyor Services, our expertise is often an invaluable asset when improving an initial design for unique projects. In some instances, such as the case highlighted here, the initial specifications by the customer are inconsistent or incomplete, and require an experienced crane fabricator to determine the system requirements. For this project, we were asked by several regular customers to make a bid on the fabrication and installation of two cranes, which were included as part of an overall sewer system improvement project. However, the initial specifications that were provided did not make sense and the engineer was non-responsive to requests for clarification. The engineer did eventually provide an addendum which addressed some concerns, but there were still a number of issues that remained unresolved at the time of bidding. Since we had a history with this customer, we went through with the bid submission. Our deep level of experience in the water treatment industry allowed us to make some educated speculations about the best course of action. Our engineering and designing team submitted suggestions regarding how we felt these two small cranes should be built. The initial specifications outlined an electrical actuation of a powered trolley movement, but this design was not congruent to the crane's purpose. Our designers suggested a powered bridge with the electricals routed to the center driven bridge, with the crane re-designed to fit into a smaller space than shown on the structural drawings. The customer had actually originally wanted the system to operate in this manner, rather than with a powered trolley, but the original intent had been lost in the specifications and addendums. 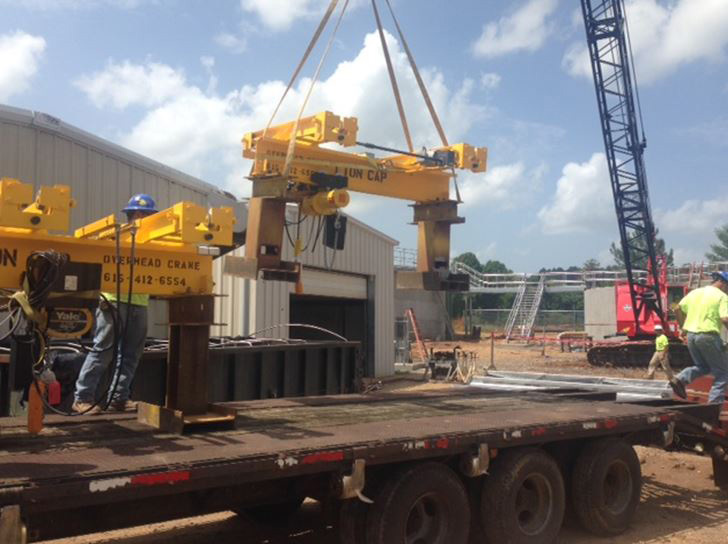 By working through the design with the customer, we were able to provide them with a crane system that met their functional needs, with a corrosion resistant hoist and weather-proofing included. This was our 6th project for this contractor, and they were pleased with all aspects of our work, including our ability to meet their requirements while making everything fit. For additional information about this custom crane design, fabrication, and installation project, see the table below,or contact us directly.